Cleaning the 350,000 square feet of carpeting in the Mohegan Sun Casino is likely one of the last things visitors think about while being entertained in the southeast Connecticut facility. But, for Pete Mauro, the EVS Heavy Duty Shift Manager for the casino, it’s invariably one of the things he thinks about most. This large, busy casino also presents a carpet cleaning challenge because it is open 24 hours a day, seven days a week. Vacuuming is typically not a concern as long as the equipment is relatively quiet and precautions have been taken to ensure no one trips on the cords. However, the actual cleaning of the carpets is an issue. Interim carpet cleaning—dry, shampoo, encapsulation, or bonnet—are relatively fast, but typically will not do the job; these strategies offer only surface level cleaning. Due to the heavy foot traffic that essentially pounds soils into the carpet, the best option for thorough soil removal in this casino is carpet extraction. 2. How quickly can the work be done. Mauro and his team solved these issues with four CFR Cascade 20 carpet extractors, along with the larger Pro 750 from CFR. Addressing drying time, the CFR systems use wands that “atomize” solution, flushing it through the carpet fibers, and recovering it simultaneously, never letting it soak into the carpet backing and pad. 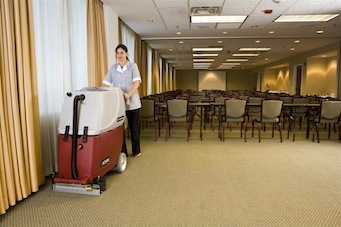 The results are cleaner carpets that dry far faster than when conventional systems are used. Addressing productivity, CFR produces the only recycling carpet extractors available. Solution is filtered and recycled so that it can be used up to seven times. This increases worker productivity significantly. “My staff is now doing in one shift what used to take three or four nights,” Mauro says.